A one-dish-fits-all solution from the British - Scones are great for lunch or dinner. Substitute the pulled beef with some smoked turkey & cheese for a breakfast treat. View the full recipe below. Sift flour, salt, baking powder, baking soda into a mixer, add cold butter and mix until coarse crumbs. Add eggs, milk and yogurt and mix on low speed, add cheeses and keep mixing until incorporated. Take the dough out of the mixer and knead on lightly floured surface for 1 minutes. Roll dough 1.2 cm thickness, cut with 6 cm cookie cutter. Brush with egg white and water, sprinkle chopped dill and cumin seeds. Lay on parchment paper and bake in oven on 180°C for 10-12 minutes. Place pulled Lamb, water, and Knorr Demi-Glace Brown Sauce Mix on medium heat, add Worcestershire sauce, season with salt and pepper and bring to a simmer until incorporated and thick. Keep warm. 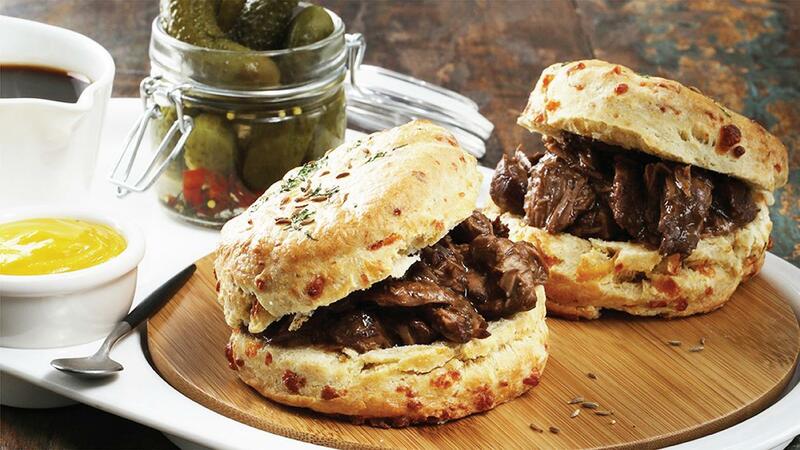 Open warm scones in half, and start by adding Hellmann's Classic Mayonnaise, top with pulled Lamb mix, add pickles and finish with English Mustard , serve with Demi- Glace sauce on the side. Place 500ml water into a pot, whisk in the Knorr Demi Glace Powder and bring to the boil stirring continuously; Serve on the side.